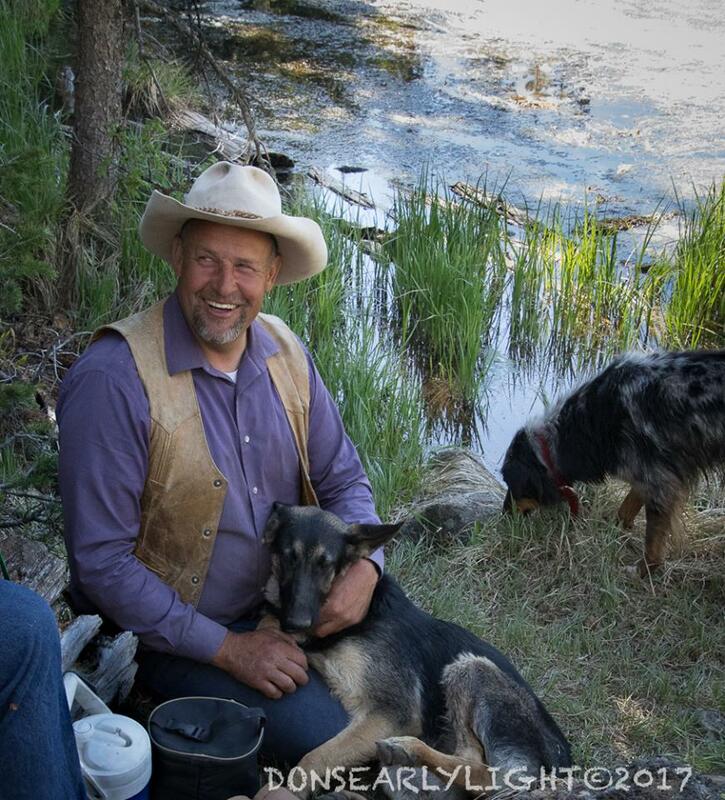 A Shepherd's Heart — Attempting to Explain Ole Lindgren | RANGEfire! First publish in Range magazine. Although it would take at least a full book to examine the life and times of Ole Lindgren, and explain what makes him tick, a good place to start is with his heart. 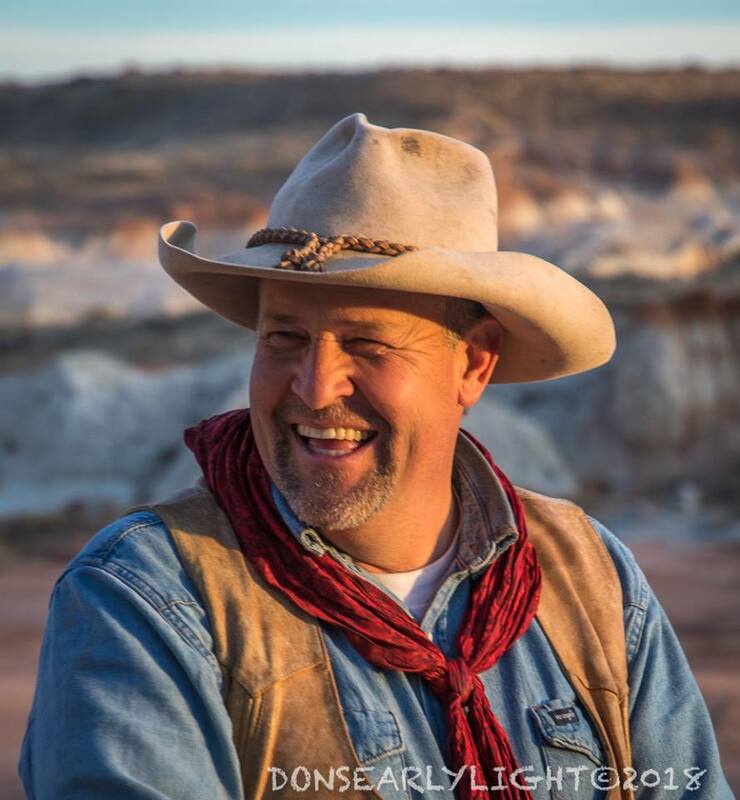 Ole Lindgren is a rancher, a horseman, an artist, and a musician, but there is much more to the equation. During the stage of his life when Ole moved around, cowboying for a variety of ranches, when ranchers would ask Ole about himself in job interviews, he would say, “Well, I was born a horseman on a horse ranch, and I intend to die a horseman on my own ranch.” It usually became apparent quite quickly that he had a gift with horses, so they would typically either try to make sure that he was well-mounted, or put him on the rankest outlaws and most challenging horses they could find. What Lindgren never disclosed was his true feelings about cows. According to Ole, “Being a sheepman in cattle country is about like being a gay Mormon in a Catholic monastery—you better keep it in the closet.” And if you add goats to the equation, you might as well be a nudist Buddhist – even most sheepmen have no use for goats. Ole learned such lessons the hard way. At one point, fairly young in life, he worked for locally renowned cowman, Neil Mortensen, who owned a number of ranches, funded in part by a significant interest in a large producing coal mine. Mortensen had taken Ole under his wing and given him many opportunities in the ranching world. And Ole had blossomed into a top hand, broke all of Mortensen’s horses, and had essentially become his right-hand man. So Ole was really dreading the prospect of breaking the news to Mortensen that he was considering the possibility of shifting gears and buying a herd of sheep. Mortensen was in a good mood, already smoking a cigar, and this would be the perfect chance to talk. As they were driving down the road, Ole eventually mustered the courage to tell Mortensen about his plans. At that moment Mortensen shifted his cigar from one side of his mouth to the other as he always did when he was about to say something profound, so Ole knew something important was coming. Then Mortensen suddenly hit the brakes, came to an abrupt stop, and barked “Get out!” Ole attempted to protest, but Mortensen bellowed, “GET OUT!” which he did. Then Neil Mortensen squealed tires as he drove off, and never came back. At first Ole thought it might be a joke, but quickly learned that it wasn’t, as he eventually started trudging toward town in his riding boots. So Ole Lindgren was suddenly out of a job. Although he didn’t have a place to run them, he knew where he could buy a herd of sheep. And he had an idea where he might go with them. Vince Pace, forester for the Fish Lake National Forest—who had a paper hanging on the wall above his desk identifying him as “god”—had announced that he wasn’t going to allow any more sheep on Monroe Mountain unless someone could clear-off the bunch of feral sheep that had accumulated in the rocky crags near the top of the mountain and were almost impossible to gather. “These sheep are hammering the resource year-round, and it’s got to stop,” he said. This band of feral sheep had slowly grown every year as more and more stray sheep belonging to the aging sheep rancher who grazed the allotment had escaped from his summer herds and joined the feral band. In addition to being a master horseman with a shepherd’s heart, Ole is also a serious dog man, and has a pack of dogs with legendary capabilities (which could be subject of a story all by itself). With god Pace’s assurance that if he could clear the feral sheep off, he would be given a probationary opportunity to use the allotment, Ole set to work. He added a very unique new dog—a greyhound/border collie cross named “Schizo” —to the mix. This was a dog that might stand a chance of cutting the feral sheep off as they dashed from the high meadows where they grazed—and stood a chance of being caught—to the cover of the rocky crags where there was no chance of catching them. 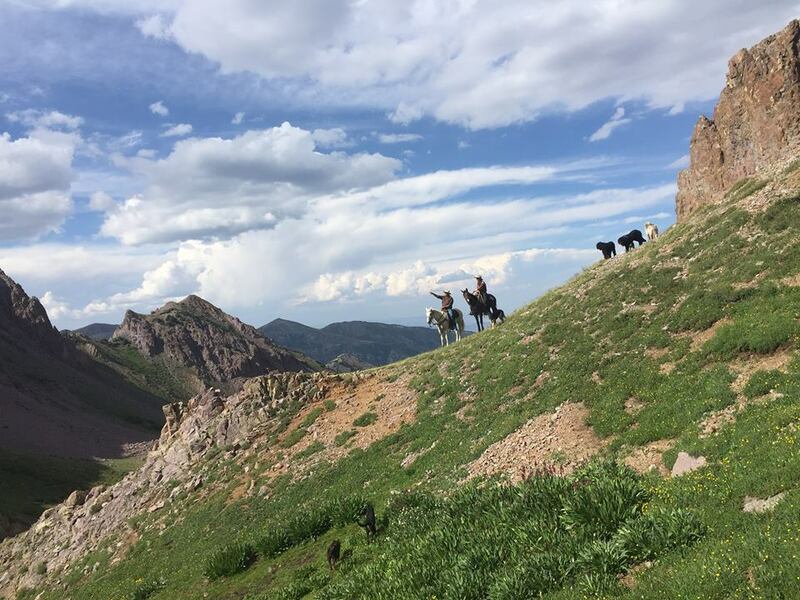 Amazingly enough, Ole’s plan worked and with the help of a pack of extremely capable dogs, including Schizo, he started slowly catching feral sheep one at a time, hog-tying them, and packing them off the mountain two at a time. 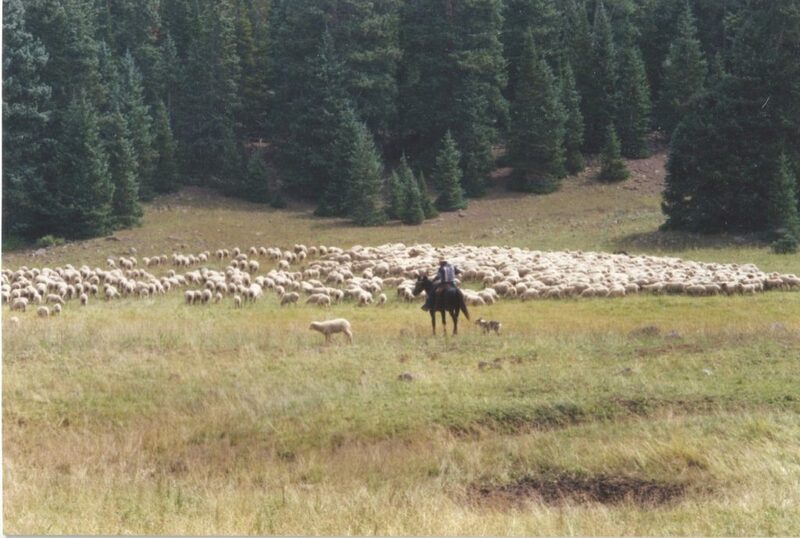 Because it required two sheep to make a balanced load on each side of a pack mule heading off the mountain, sometimes Ole would have to leave a sheep tied down until the next day when he would try to catch a few more so that he could pack them off in balanced loads. With the help of his ultra-capable dogs, his pack mules, and ultimately his rifle, Ole eventually cleared every last one of the feral sheep off the allotment. He then insisted that forest god Pace join him at the local coffee shop to make the announcement that he was going to allow Ole to return with a herd of sheep to the allotment, under a myriad of strict probationary requirements to help, among other things, ensure that the feral sheep issue did not return. God Pace’s announcement that Ole had managed to clean-up the allotment and was therefore being given the chance to use it, really got the local rumor mill going. The next summer, Pace and his range cons watched Ole and his sheep like a hawk. But again, Ole had an idea—for dealing with extra scrutiny from regular range tours. As a chef-quality camp cook, Ole would always try to feed them lunch before they looked around. Some days he would spend the whole morning preparing and cooking the meal, and then dash off the mountain to intercept or meet the touring range con(s) as they were headed up the mountain, to invite them to lunch, having carefully instructed his herder to put the meal on to heat so that it would be perfect when they arrived. Ole—who is also, and perhaps most importantly, a master storyteller—would then entertain them for an hour or two with stories while stuffing them to the gills with the best sourdough biscuits, lamb (not mutton), and delectable Dutch oven potatoes, before mounting up to look at the range. The other part of the strategy was that unlike anyone and everyone else, Ole would never let his sheep more than “pass through” the prime grazing areas including big open meadows and riparian areas, so there would be just enough sheep droppings to show that sheep had actually been there, but never the slightest sign of any abuse, leaving a super abundance of unused feed. Otherwise, they would also completely avoid all the normal high-traffic areas so they didn’t get pounded. 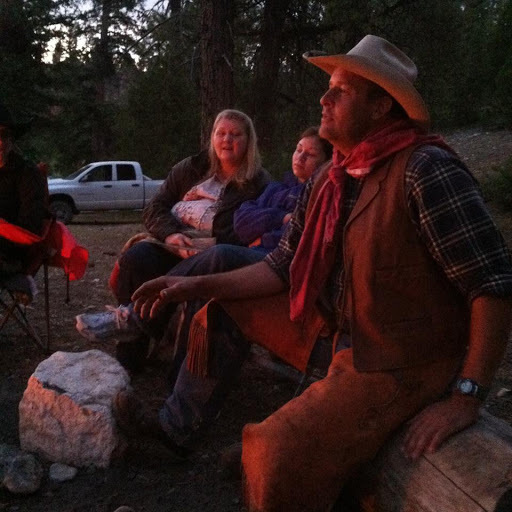 Postscript: Ole Lindgren is a local living legend in South/Central Utah. In addition to being a master horseman, rancher, artist, musician, husband, and father of 11 children, Ole is a true shepherd. In the process of running 3000 head of sheep, 1500 head of goats, 100 head of horses and mules, 50 head of dogs, 11 kids, and a few milk cows – all at the same time – Ole has acquired some amazing stories, and he is a maestro storyteller. BRAVO, Ole. Thanks for “being” !